Talk trails to urban residents and you are likely preaching to the converted. Trails have long been recognized as one of the best-used and most cost effective recreational facilities in modern urban centres. They allow residents better . . .
A leisurely bike ride from Lacombe to Ponoka could soon be a possibility, according to the president of the Central Alberta Region Trails Society. Debbie Olsen said an increasing number of municipalities are helping develop a . . . The Central Alberta Regional Trail System got another boost after Lacombe County council agreed on Thursday to put money towards a bridge over the Blindman River. Most of the cost will come from a $200,000 grant from the Alberta . . .
City Councillor Larry Pimm stops to read a plaque dedicated to Bob Johnstone, following a trail dedication ceremony held at Galbraith Park on Thursday. A 500-metre trail linking the 55th Street parkway to the south bank trail . . .
ATVs, horses, hikers and bikers may soon share a new trail system running between Rocky Mountain House and Nordegg. Clearwater County council this week chose Rimbey-based Armstrong Consulting to look into various . . .
Michael O'Brien was a long-time Red Deer River Naturalist and founding member of the Ellis Bird Farm, who died . . .
People got their first look this week at detailed, long-term plans for trails, parks and other open spaces in Red Deer County. About 20 people came out to an open house on Tuesday at Red Deer County Centre to see maps of seven zones . . .
An abandoned rail line west of Rocky Mountain House could be transformed into a haven for hikers and cyclists lured by river-spanning bridges amid spectacular mountain backdrops. It's a vision that Clearwater County has been . . . The progress of the Central Alberta section of a cross-Canada trail has taken several steps forward with a promise of money for a pedestrian bridge across the Blindman River. "Alberta TrailNet has pre-approved $100,000, as soon as . 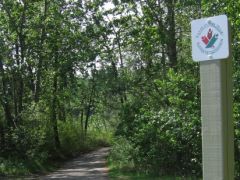 . .
A $1.2 million investment from the Alberta government will support efforts towards completing the province's 2,200-kilometre portion of the Trans Canada Trail. "The Trans Canada Trail is a key component of our provincial trail . . .
Red Deer County council has approved construction of three trails, kick-starting a major effort to boost recreational opportunities. A 3.6-km trail will be built from Springbrook to Penhold, a 6.8-km trail will be built between Spruce . . .
Trans Canada Trail organizers are looking at bridging two rivers to accommodate hiking and biking trails between Red Deer and Ponoka. "Rivers are major trail blockers. You can't build trails without building bridges," said Derry . . . The Central Alberta Regional Trails Society (CARTS) is pleased to announce the registration of 70.6 kilometres of trail designated as Trans Canada Trail. Debbie Olsen, CARTS chair, said, "We're absolutely thrilled to be able to . . .
A Central Alberta trail group is optimistic that 80 km of rural trails will soon become part of the Trans Canada Trail after five years in the making. Central Alberta Regional Trails Society expects to hear any day whether its planned . . . If you build it, they will come. That's what Debbie Olsen, acting vice-president of Central Alberta Trail System (CARTS) believes about the estimated $4 million to $6 million, 90-km trail that will stretch for Penhold to . . . The Central Alberta Regional Trails Society (CARTS) has big plans for the old highway linking Penhold to Springbrook. Before the summer is over, they hope to use the old portion of Highway 2A for a trail linking the two . . .
A 3.2 km pedestrian-bicycle trail along the old Highway 2A right of way linking the communities of Penhold and Springbrook is being proposed for both recreational and urgent safety reasons, Red Deer County heard Tuesday. The . . . The family of Bob Johnstone sadly announces that he passed away at the age of 67 years in the Red Deer Regional Hospital on April 16, 2006 after a brief illness. Bob is survived by his twin sister, Mary Ellen (Larry) Olnick and . . .
Building new trails and improving existing pathways are among recommendations heading to Red Deer city council this month. The Recreation, Parks and Culture Board approved a trails and pathways master plan on Tuesday for . . .
Every community needs people who can take a good idea, hold on to it and patiently work it into completion. People like Bob Johnstone, president of the Central Alberta Region Trail Society. He's bought into the idea that a national . . . The radical rise in the cost of gasoline underscores the need for communities to develop vibrant local, regional and cross-Canada trail systems, a trail proponent says. Bob Johnstone, president of the Central Alberta Regional Trail . . .
Central Alberta's trail groups are slogging ahead with efforts to develop networks of pathways. Sherry Scheunert, chair of the Central Alberta Regional Trails Society, said they are working on developing the so-called Bluebird Trail . . .
Plans to route the TransCanada trail through portions of Central Alberta have stalled. "We're not working on any trail development in that (Torrington, Wimborne) area right now and probably won't be for some time," said Linda Strong . 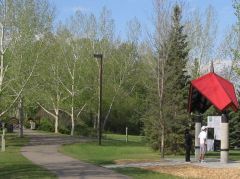 . .
For over a century, the forerunner of the Calgary-Edmonton Trail was an important conduit of communication and movement between the open prairie and Fort Edmonton. Situated in the vast expanse of a glacier corridor, this trail . . . Capitalizing on Central Alberta's rich scenery organizations like Central Alberta Regional Trails Society (CARTS) will ensure adequate trails are constructed for residents to enjoy. Although CARTS does not actually build new . . . The chain of committees working to build the Trans Canada Trail have been spending the past week putting out the fires that sprang up with the news that major portions of this trail network would be open to motorized traffic. . . The Central Alberta Regional Trails Initiative is proposing three trails to municipalities and interested individuals and groups in the counties of Red Deer and Lacombe. Red Deer County council was told last week possible routes are: . . . It could be a short stroll or a long-distance jaunt but one thing seems certain -- new trails will be developed in Central Alberta. It all depends on the public will, said Central Alberta Regional Trails Initiative co-ordinator Deb Comfort. . .
Plans for a Central Alberta trail system are in the works but with no mandate or firm commitment to build, the initiative's path is still uncertain. "I have no idea how many trails are going to be built," said Deb Comfort, . . . Recreational trails may someday link Red Deer, Innisfail, Lacombe and Sylvan Lake. Red Deer groups have banded together to plan trails through the region. Called the District Regional Trail Steering Committee, the group is hiring . . . Despite the support of two Central Alberta MLAs and the city of Red Deer, a recreational trail through some Central Alberta areas won't be any easy sale, one local director says. "There are still major obstacles," said Bob Johnstone, a . . .
Do you enjoy jogging along the river between Heritage Ranch and Bower Ponds, or cross-county skiing around the River Bend Golf Course? How would you like to ride a horse from Red Deer to Sylvan Lake, or cycle across the country . . . Easing the fears of landowners is a major goal of those planning a trail from Red Deer to Sylvan Lake. Central Alberta members of Alberta TrailNet are looking at turning an old CP Rail line into a path for cyclists, hikers and even . . .